I Skate, Therefore I Am: The biggest skateboard website in the world sold to a clothing company. The biggest skateboard website in the world sold to a clothing company. The biggest skateboard website in the world sold to a clothing company? 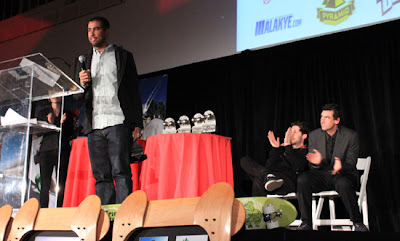 Eric Koston at IASC in December 2010. Will the best and biggest skateboard website in the world lose its autonomy after the announcement that LJG group has formed a "partnership with the world's leading skateboarding website and facility, The Berrics, founded in 2007 by professional skateboarders Eric Koston and Steve Berra"? Maybe not since LJG has also announced that Koston and Berra “will retain full control and ownership of The Berrics”. With more than 6 million unique visitors and 20 million page views per month, The Berrics is unique in the skateboard industry. It is running full steam and crankin’ out some of the best skate footage in the world. Whether it’s at the park or out in the streets, or regarding the evolution of online content, The Berrics is constantly pushing the progression of skateboarding, which ultimately benefits the industry as a whole. New and exciting endeavors are no stranger to The Berrics. LGJ is thus making an indent in skateboarding after following long-term relationships with surf and moto brands. 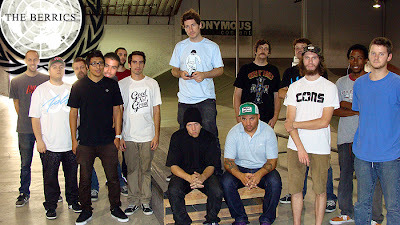 The Berrics is (was) the most powerful independent skateboard website in the world, whose ranking was only partially matched by the CCS Blog (who just recently beat The Berrics at Alexa’s Ranking), SlapMagazine, Silverfish, Concrete Disciples, SkateDaily and Skate&Annoy. The biggest (non independent –non-branded) skateboard websites in the world are still Transworld and Thrasher (but Transworld is cheating by having the Surf, Skate, Snow and a bunch of other divisions under the same root address). Below is an excerpt of the press release from LJG. "The Berrics brings an exciting media and business model to our industry, and we want to reinforce the groundbreaking efforts they have made these last three years," said La Jolla Group CEO, Toby Bost. "It's about giving them what they need to expand skate culture to an even wider audience globally in ways that only they can. By supporting the home to a very dedicated fan base as a result of the site's content, events and grassroots ambitions, we can accomplish those goals." The Berrics' grassroots approach extends itself in many directions, one of which includes offering independent skate retailers (in all 50 states and Canada) opportunities to buy special collaborative product and advertise, via geo-targeting, on the site through the Berrics Unified program, an important part of The Berrics' DNA. "Eric and I started The Berrics because we felt the industry, and its professionals, had lost their footing largely in part to technology change. Our goal has always been to do what we can to help create a healthier industry by providing a destination, both physically and in cyberspace, whereupon the pros, the ams, the companies, the shops and the skateboarders not only felt closer to one another, but were all empowered, winning and communicating with each other," said Berra. "With the resources that have been available to us so far, our own pocketbooks, I think we've done a fantastic job. When given the opportunity to partner with someone like La Jolla Group, take advantage of their infrastructure, still retain full control and ownership of our company, not have to worry about them having skate brands that compete with our advertisers AND get the job done was something we couldn't pass on. We want to see skateboarding and the people who make it happen, from top to bottom, do better, especially in these tumultuous times." With LJG's 21st century infrastructure, The Berrics will continue to build and protect the successful business platform Berra and Koston have created. The relationship will improve The Berrics' existing and future initiatives, help extend them globally, and continue to fulfill LJG's diversification strategy as a leader in youth culture. The partnership with LJG will also enable The Berrics to focus more on their philanthropic endeavors in North America, following their first public skate park in Westchester, CA, which is scheduled to open in late Spring 2011. "Skate is here to stay, and with The Berrics leading the sport's grassroots future, LJG will offer our trademark collaborative approach, putting our best minds together to make sure this is a win-win for everyone," said Bost. La Jolla Group's brands include O'Neill Clothing USA, Metal Mulisha Clothing, Rusty North America, and True Love & False Idols.